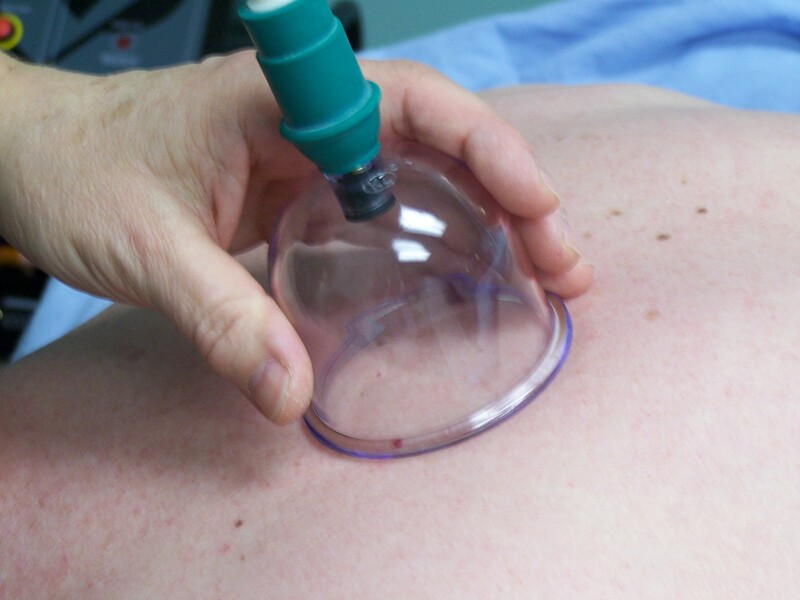 Cupping Therapy in Freehold, New Jersey. Cupping Massage does not create bruises, unlike Traditional Fire Cupping, while it has profound effect on the tissue, muscle or joint treated. 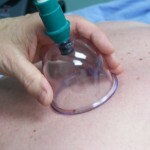 Massage Cupping uses plastic cups and a hand pump to create suction on the body. The cups are moved over the skin by gliding, shaking and rotating techniques, while gently pulling up on the cup, or are “parked” for a short time to facilitate soft tissue release and joint mobilization. The suction reaches deep into the soft tissue, producing a “separation” in the tissue layers, enabling water absorption and renewed blood flow to undernourished tissue, which is invaluable in pre- and post-surgery treatments, as well as a catalyst for change in many health conditions. The suction has a sedating effect on the nervous system, while pulling congestion and toxins from the body tissues, so that the skin and lymphatic system can easily eliminate them. The vacuum lifts and releases rigid soft tissue as well as scars, adhesions and restrictions. By clearing debris, creating drainage, and easing limited movement, this therapy relieves pain and promotes healthier tissue. The VacuTherapies machine adds technology to refine even further the technique of massage cupping. It stimulates the arterial and venous blood flow along with the lymphatic drainage. Joint mobilization and deep tissue techniques can be accomplished with ease and comfort. It supports surgery for orthopedic and sports issues, and shortens recovery time from events and injuries. Dry Cupping Massage achieves powerful results for pain relief, joint mobilization and release of tight muscle tissue, lymph drainage and detoxification, scar reduction, pre- and post-surgery therapy to shorten recovery time, skin toning and firming, cellulite reduction, contouring the body and face. Application of cupping therapy for pain relief has been seen on “The Dr. Oz show” and it is discussed on Sharecare. At the Summer Olympics Rio 2016 several athletes and swimmers, including Michael Phelps, showed in competition with marks on their bodies from vigorous traditional cupping, applied for muscle detoxification and increased performance. It is testimony to the effectiveness of this therapy. Please call 732-462-0909 for more information, to make an appointment and for a free consultation.